1. 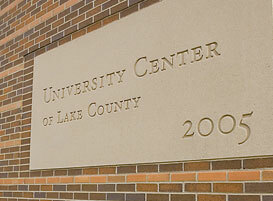 What is the University Center of Lake County? The University Center, a consortium-based center, provides high quality educational opportunities for the residents, workers, and employers of the Lake County region. We are an independent 501.c.3 organization with our primary facility and Conference Center located in Grayslake, IL, and a smaller facility in downtown Waukegan, IL. We provide higher education and professional development programs through a unique partnership of private and public Illinois colleges and universities. The Conference Center is part of the University Center, and the revenue generated from Conference Center business helps to support the core academic mission of the University Center. 2. Where is the Conference Center? 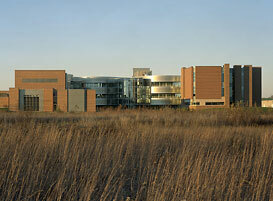 The Conference Center is part of the University Center of Lake County in Grayslake, IL. We are located on the campus of the College of Lake County near the intersection of Washington St and Lancer Lane. We are 10 minutes west of I94, and midway between Chicago and Milwaukee. See the How To Find Us page for greater detail. 3. How far is the Conference Center from the airport, or from the downtown area? 4. Are you affiliated with the College of Lake County (CLC)? While we are located on the campus of the College of Lake County, we are independent of the college, with our own staff, governing board, and finances. We do work closely with the college in ensuring that CLC students have higher education opportunities here at the University Center. 5. Is public parking available? We have free parking onsite, adjacent to our building. 6. How do I request a tour of University Center and the Conference facilities? Simply call or email us and we will be glad to set up a tour of our facilities for individuals and organizations. 7. Where can I stay while attending my event? There are approximately 10 hotels within 10 miles of the Conference Center. See this list of Local Accommodations. Mention the University Center when you book your room, and receive negotiated rates. 8. I'm coming to attend an event and need to leave a number where I can be contacted. What is it? You can provide people with the main number here at the Conference Center 847.665.4000. Please also provide people with the name of the event or class, so that we can quickly find you if need be. 9. What are the hours the facility is open? We are typically open weekdays from 7:30AM - 10:00PM, and weekends based on client needs. If access is needed beyond these hours, we will make our best effort to ensure you have the access and services you need for your event. 10. Is the facility ADA accessible? Yes - we are ADA accessible and have two elevators available. 11. Where is the Waukegan facility - and what is available there? Our Waukegan facility is located in downtown Waukegan, IL - at 1 N Genesee St. - Suite 300. We have approximately 6000 sq. ft. of meeting and classroom space, with a computer lab, and videoconferencing capabilities. 1. What type of events can be held at the UCLC Conference Center? The primary mission of the Conference Center is to host professional events including networking events, meetings, and non-credit educational programs including workshops, professional development and employee training. We can host most any type of event, with the exception of some social events and weddings. See this page of typical event types. And if you are uncertain, we will be glad to discuss the viability of hosting a unique event here at the Center. 2. How do I schedule an event? You can use our Booking Wizard found in this website, or you can contact our Event Coordinator – Jennifer King - at 847.665.4008 - jking@ucenter.org. 3. How far in advance should I schedule my event? We can book as far as 18 months in advance. However, it is also possible to hold some events on the same day as scheduled. Advance planning is always appreciated and not all requests can be honored without adequate notice. Cancellation policies vary depending on the service requested, but we strive to allow our clients as much time as is needed to ensure a successful event. 4. Can I host an event on the weekend? Yes - our Conference Center is available for weekend events. 5. Can I have a 24 hour hold on my meeting space? Yes - we can place a hold for your reservation while you determine your needs. Our standard attrition policy includes partial penalties, beginning at 90 days prior to the event (25%), and full payment for cancellations within 5 days of the event - when food orders are already processed.We will customize this attrition policy when working with frequent clients. 7. Can you help me organize a training session or seminar at the conference Center? Yes, we would be glad to work with you to understand your audience, desired outcomes, and timeframes- and then engage the resources of our member universities and our partners in workforce development to create a successful training session or program of classes. 8. What type of registration services do you provide? For an additional fee we can provide Internet-based enrollment management services. 9. Will you list my event on your Web site? We do not publish our calendar of events on the Internet. However we are willing to consider posting of individual events with an additional marketing fee. 1. What are the room sizes and capacities of your conference rooms and meeting areas? We have a variety of room sizes that hold from 8 to 250 people, depending on your desired configuration. Please see the Capacity Chart for greater detail. 2. What is the square footage of your largest space? Our Great Room is approximately 2,450 square feet, and can accommodate up to 250 people in theatre style seating. It can also be subdivided into three separate spaces. 3. What equipment is included in my rental? Every meeting room comes equipped with a PC, DVD/VHS player, document camera (digital overhead), ceiling-mounted projection system, and touch screen interface panel - for no extra charge. 4. Do you have breakout space? Yes - we have a variety of rooms available for breakout space, including small conference rooms that seat up to 8 people, and standard classrooms accommodating 20 - 50 people. 5. Is there a computer lab? We have three computer labs - each with 33 PCs. Each lab is equipped with Net Support classroom management software, which enables the instructor to manage and monitor all student PCs from the instructor PC. We also provide a virtual desktop environment which eliminates virus activity and enables the efficient distribution of applications and software. We can preload your licensed software on our network, and make it available to only your room, provided we have a minimum of 14 business days to install and test your software. 6. Do you have videoconferencing rooms? We have three dedicated videoconference rooms, fully equipped with Tandberg videoconference systems, PCs, multiple cameras, integrated audio, and touch screen panels for managing your videoconference session. We also have a portable videoconference unit to turn most any space into a videoconference meeting space. 7. Can you provide quiet space for phone calls? Yes - we can provide small breakout rooms for private conversations. Ideally we would know this when reserving space for your event - but we can also respond to last minute needs like this. 8. Is there a charge for setup/teardown? No - there is no extra charge for room setup or teardown. 9. Can we use the courtyard? Yes - you are welcome to use our courtyard for outdoor activities, or to enjoy lunch and breaks. 1. What food options are available for session breaks? We have full catering services, with everything from continental breakfast to dinner with cocktails. Meals are prepared onsite in our industrial kitchen by our professional catering (link to Catering main page) partner. 2. What food service arrangements do you have for handling special dietary needs? When you are planning an event, please let us know of any special dietary needs or requests. We'll be happy to work with you and our caterer to meet any special dietary considerations. 3. Can I use my own caterer? No - any catering at the Conference Center is managed exclusively through our catering service. 4. Can I bring my own food into the Center? No - meals must be through our catering service or our café. 5. How much notice do you need for food orders and final headcount? With catering orders we need 5 business days for final food order.For non-catered events, we simply need headcount estimates the week prior to ensure the best size room is available. 6. If meals are not offered as part of the event I am attending, what options do I have for food? Our café is open for lunch as well as for late afternoon and evening meals. The schedule varies on weekends. It is wise to call ahead if you plan on visiting our café to ensure it is open. The café meals are prepared onsite by our professional catering partner. 7. Can I eat in my meeting room? Yes - with the exception of our computer labs, clients are able to have their meals directly in their meeting space. 1. What classroom equipment (AV) do you have available? Every classroom and meeting room has Internet access and is equipped with a PC, secure wired Internet access, a DVD/VHS player, document camera, and integrated overhead projection system. All classrooms also have a touch screen panel to easily manage a presentation with multiple sources. These systems are included in the room at no extra cost. Additional equipment and services including webcasting, videoconferencing, and video recording are available for an extra charge. 2. Is wireless access to the Internet available? Yes - we have free wireless Internet access throughout our entire facility, with ample bandwidth. Conference Center guests also have access to computer kiosks for Internet access and MS Office software. 3. Do you have videoconferencing or webcasting capabilities? Yes - we have videoconference systems, as well as webcasting and session recording systems. We originate and receive videoconferences, web conferences, webcasts, and audio conferences. We use Tandberg videoconference systems, and MediaSite webcasting and rich-media recording and hosting services. See our Technology & Media Services section for greater detail. 4. I am considering a videoconference meeting. What are the technology requirements at other sites required to connect with the University Center via videoconference? The University Center can connect up to 3 sites with dedicated videoconferencing equipment that is Internet capable. These sites would need to have systems that use the industry standard H.323 protocol. If more than 3 sites are to be connected, we can leverage a bridge service for an additional fee. Our conference suites can also participate in web meetings such as WebEx, Skype and Adobe Connect. Before your meeting the technology staff will conduct a test connection with the other site(s) to determine any limitations. The results will be communicated to you so that you may make the best decision about how to conduct your meeting. 5. I've never attended a videoconference or distance education event. How does it work? Typically this involves two or more videoconference locations, each equipped with cameras and videoconference equipment. Attendees are able to see and hear the presenter, as well as view the presentation via a second screen. Depending on the connecting location's capabilities, attendees can also view their colleagues from other locations, and the presenter can manage all screens from one location. 6. Do you offer training for your videoconference - distance education technologies? Our rooms and technologies require little training, and onsite technical/AV staff will always be available for your event. Should you desire an orientation to using any technology at the Conference Center, we will be glad to spend the necessary time prior to the event to ensure you are comfortable with our tools and services. 7. Can conference proceedings be made available on a CD? As part of our Technology & Media Services, we can record your event, and host it on our server, or make it available in CD/DVD formats. We do require advance notice on these fee-based services. 8. How can I put my video clip on the Web? We can host your video/presentation and make it available on the Web via a simple link, or we can provide you with the necessary files to enable you to make it available on most any website. We do require advance notice on these fee-based services. 9. Do you provide streaming services? Yes - we can webcast events live, as well as record events for editing and on-demand viewing. 10. May I supply my own computer or AV equipment for my event? Guest laptops are easily connected to our integrated presentation/projection system. We encourage clients to use our equipment as it reduces the need for support. However we will work with you to enable you to use your equipment where there is a need. 11. Where can I check my email while I'm at the Conference Centers? The Conference Center has free wireless Internet access throughout the facility. We also have a number of kiosk computers available for clients to check email, browse the web, or use MS Office software applications. 12. Can I print materials or send/receive faxes? For a small service charge, we can assist you with business services such as printing, copying, and fax. 1. What are the rates for hosting an event? Our rates include integrated technology and audio visual services. Rates start as low as $35/hour for small meeting rooms and $48/hour for standard classrooms. Rates for larger spaces and/or advanced technology services are determined based on the total package of space, catering, technology, breakout space, etc. Discounts are available for non-profits, and frequent clients. No - no deposit is required for reservations at the Conference Center. 3. Are there discounts for non-profit organizations? Yes - upon presentation of appropriate documentation, we typically discount non-profits room rentals by approximately 20%, depending on the services provided. For catering we typically discount food orders by 10%, and eliminate sales tax, and gratuity charges. 4. What is the Billing address, including email and contact information? 5. How can I pay my bill? Do you accept credit cards? You can pay via check, cash, or credit card with an additional service charge of 5%. 6. What is the University Center's FEIN or Tax ID Number?